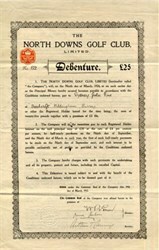 Beautiful certificate from the North Downs Golf Club issued in 1912. 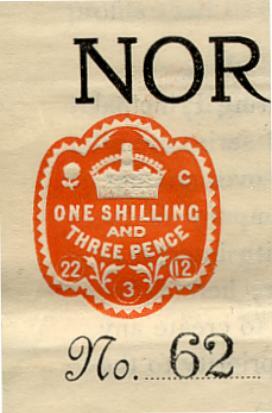 This historic document has an ornate border around it. This item has the signatures of the Company's President and Secretary and is over 94 years old. Founded in 1899, with the Club formed six years later, the original 9-hole course survived many rigours for 66 years when a further 31 acres were acquired. This allowed additional holes to be constructed turning the course into the challenging 18 hole layout that exists today. At 5843 yards, with a par of 69 and a Standard Scratch of 68, the course is not long but compensates by demanding a considerable amount of accuracy and thus provides a good test of golfing ability. Despite its location, most holes offer a flat or gently sloping prospect with only the 17th having anything like a severe slope up to the green. The real challenges can be the quick pace greens in the summer and keeping the ball in the right place for the next shot.